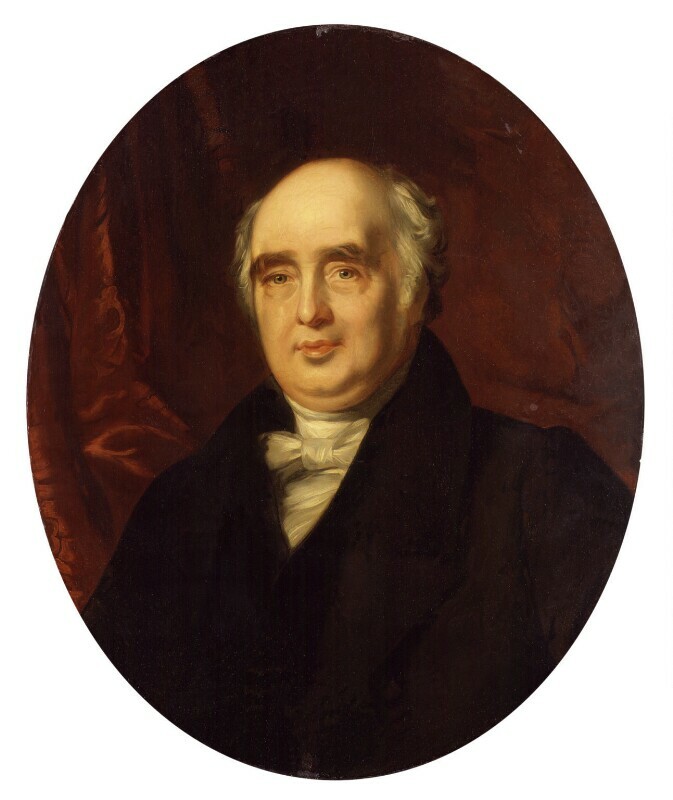 Leslie's original portrait (llchester collection) was probably painted at Holland House in 1829. In a letter to H. E. Fox 19 May 1829 Lady Holland wrote, 'such as he is, with some reluctance I have prevailed on him to sit for his picture, a small size by Leslie. It is astonishingly like; but Mr Leslie, who besides being an admirable artist, is a most agreeable man, comes here and works upon the picture in the Yellow Room' (Lord Ilchester, Addenda & Corrigenda, 1937, p 12). Leslie himself wrote to his sister Eliza, London 12 November 1829, 'I have lately spent a good deal of time at Lord Holland's painting portraits of himself; Miss Fox and Lady Affleck' (C. R. Leslie, Autobiographical Recollections, 1860, II, p 199). The Holland House Catalogue describes it as a 'small picture on panel 10+ x 81 inches, half length as an old man, seated in an armchair facing the spectator. Black coat, white tie, holds a walking-stick in his right hand'. Robinson's engraving was published in 1832 and William Jerdan in his Memoir speaks of Mr Leslie's 'admirable portrait' and its 'very striking resemblance'. John Simpson probably made the NPG copy before his appointment in 1834 to the Queen of Portugal; this is a head and shoulders only and omits the walking-stick and Leslie's background of leather-bound books. A transcript probably from an inscription on the back of the relined canvas reads: Lord Holland/the General's Father/a similar portrait to the one at the Reform Club and copies for the General -/name forgotten by him/considered very like (letter from Mrs Fox, 26 November 1873, in NPG archive). Other copies of Leslie's original are at Oxenfoord Castle (Earl of Stair), Meikleour (Marquess of Lansdowne), Reform Club (larger than original), and one given to Talleyrand by Lord Holland in about 1834 and hung at Valencay; no doubt others exist (see Lord Ilchester, Addenda & Corrigenda, 1939, pp 12-13). Head and shoulders in greenish-brown coat, dark green velvet waistcoat, white tie and shirt; thick white hair bald on top, brown eyebrows, grey eyes, pale complexion; red curtain background; contemporary oval frame in carved wood and gesso. Holland House 1834; General C. R. Fox 1845 and given by his widow in 1873. Stipples by H. Robinson for Jerdan's National Portrait Gallery, 1832 and by J. W. Cook for Saunders, Political Reformers, 1840.